How many here remember having to carry a signal mirror in their military E&E kit? 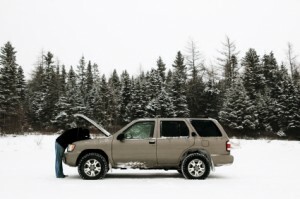 How about all the boaters, skiers/snowboarder, PSD or SAR types out there that are carrying one now? Whichever category you might fall under, I’m sure you also know how much space those can take up and that they can potentially break, crack or become a safety hazard to your fingers. 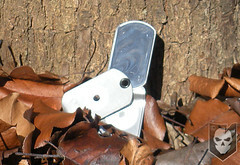 I’d like to introduce you to the future in survival gear with the SAR Eclipse Signal Mirror and Eclipse Micro Pendants. Now you can have a signaling device on you anytime, no matter where you are. Whether that’s walking in Wal-mart or trekking through a mountain range in Afghanistan. Designed by a fellow veteran Spencer Reiter who runs SAR Global Tool. These are specialized pieces of equipment that everyone’s end of the world go-bag should include. 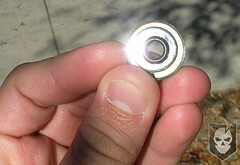 You might be looking a the photos saying that they look like a dog tag or washer, but the DTSS is actually multiple dog-tags; each piece having it’s own unique function. As military guys will know, you keep your dog tag on you at all times; whether around your neck, on your keys, or chained around your trouser belt loop. It should also be second nature to have the ESM with you all the time. 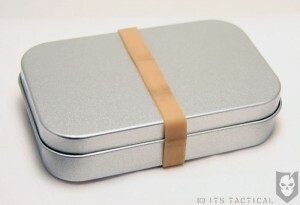 If you look closely at the DTSS it could also be used as a money clip to make it more readily available. When you open it up you see three different tags combined into one. One has a reflective polished mirror look, which is your signal mirror that wont crack or break on you. It’s highly reflective and can be seen for up to 10 miles during the day and 250m at night with a flashlight. Next you’ll see a small circle made from SOLAS (Safety of Life At Sea) 3M high intensity reflective tape, which has been approved by the USCG. This is hidden under the curved tag section to protect it. When you’re boating or in wooded areas this is a highly reflective tape that is made to withstand marine environments and extreme cold. If you want to be seen in the middle of the ocean this is something that will be beneficial to have. If you’re Military or LEO, there’s a special addition to the DTSS called GLINT tape which is 5/8” in diameter. Everyone that’s ever been in the military should know what GLINT tape is. 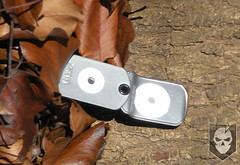 It’s the little IR squares or IR GLINT Tape on your pockets that can only be seen under NVG’s with an IR light source. GLINT Tape is for MIL/LEO Only. A standard 1”x1” square has a range of about 10,000 ft. The SOLAS was tested out to 500m with a PEQ2 and NVG’s which is well beyond the range of what a normal trekker needs. This Mil/LEO only edition is an ITARS items and is a tool you may one day need if your rucking in the out-lands of Afghanistan. 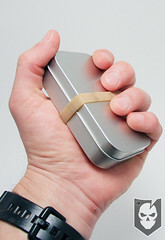 There is one last “tag” for those of use that need the ultimate swiss army of everything. That’s the Ti model that features a 6LA4V titanium tag with carbide enhanced edge on it. It’s very sharp and is used for cutting cord, boxes, people (just kidding) or anything else you need to separate. This of course costs a little more but might be worth it for those that don’t carry a knife on a regular basis. The signal pendant comes in multiple styles, colors and material. Not only are these small, useful and easy to carry and but are stylish in a sense as well. They come in Orange, Ranger Green, Pink, Yellow and Moon-Glow for those ravers out there. You know the ladies would love pink and you can get these for the kids too. 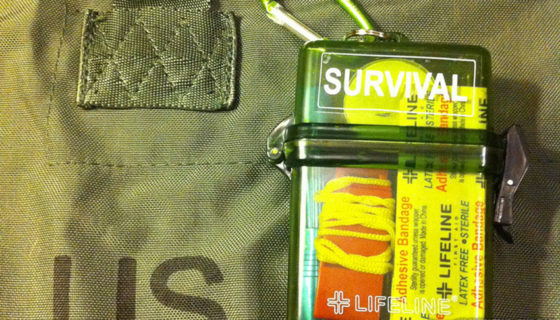 Using the SOLAS 3M high intensity reflective tape for night signaling, they come on a stainless steel bead chain with stainless steel split ring and are small enough to put on your keychain or to attach to your dog tags to be prepared. The Titanium models come in Bronze, Blue and Tri-Color. They’re flat on both sides to gain more reflective real estate instead of a dome style design. They’re a multitude of uses for these items and I’m sure everyone can continue to find even more. For anyone that’s interested in purchasing, you can pick them up from my site at SCP Security along with a few other items that you might like.